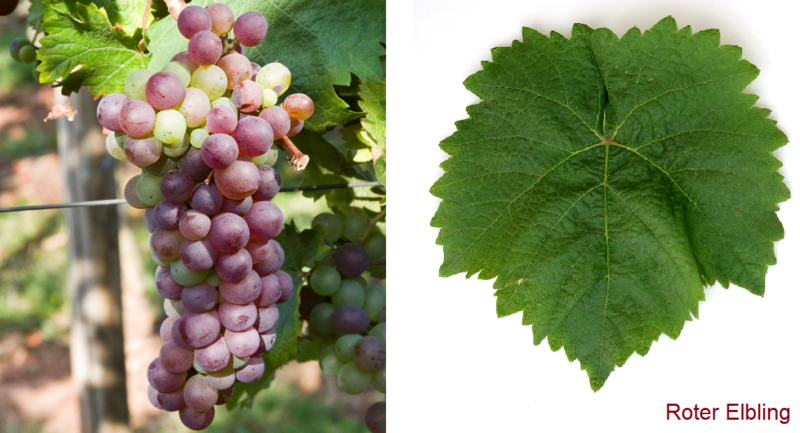 The white grape variety comes from Germany. Around 125 Synonyms testify to the old age and the once wide distribution. The most important are Aelbinen, Albich, Elbling Blanc, Frankenthaler, Grobriesling, Großriesling, Grüner Heunisch, Kleinberger, Kleinburger, Rheinalben, debt payer, Silberweiß, white Elbling , white Silvaner, white stick ( Germany ); Burgers, Burgau, Rheinelbe ( Alsace ); Allemand Blanc, Allemand Falcun, Alsacia, Gonais Blanc, Gros Blanc, Lausanois, Mouillet, Plant Madame, Raisin Blanc des Allemands, Tarant de Bohème, Verdin Blanc ( France ); Räifrench ( Luxembourg ); Burger Elbling, Alsatian, Haussard, Ysèle ( Switzerland ). The two Roman wine authors Columella and Pliny the Elder (23-79) have named a vine in their works Vitis albuelis (Vitis alba, Uva alba). For this reason, there is the hypothesis that this could be an ancestor and that the Elbling was already brought by the Romans in the fourth century from Italy and grown on the Mosel. From the Latin "albus" (white) one could indeed derive "Elbling". Of course, this can no longer be verified, but is obsolete due to the partially clarified lineage. In any case, Elbling is one of the oldest grape varieties in Central Europe. The variety was first mentioned in 1483 under the name Aelbinen in connection with the vineyards of the monastery Bebenhausen am Kriegsberg in Stuttgart together with Frennsch (see Frankish ) and Traminer called. The botanist Hieronymus buck (1498-1554) mentions the Elbling 1546 in his "Kreutzer book" as "Albich" and "Albichdrauben". In the Middle Ages, it was still the most common variety in Germany, it is believed that around 1800 here 75% of the vineyard was covered with Elbling. From then on he became the strong emerging varieties Riesling and Sylvaner repressed. But it was still widespread until the 19th century and stood with some other varieties such as white Heunisch as Mixed set in the vineyard. He arrived in Switzerland via Alsace. The early ripening vine is prone to both mildews. Botrytis and stem necrosis, It produces acidic white wines for quick enjoyment, which are well suited for sparkling wine production. In Germany, the Elbling 2009 with 576 hectares of vineyards almost exclusively in the growing area Moselle represented, there are still small areas in to bathe and Saxony, In 1986, the "Association of Friends of the Elbling Wine Obermosel eV" was founded for the purpose of image cultivation and created the 0.2 liter "Elblingbecher" with engraved Elblingtraube. Low stocks also exist in France Alsace and in Lorraine, In Luxembourg He was virtually the only vine at the end of the 19th century, today it is cultivated there on more than 100 hectares under the name Räifrench and processed into sparkling wine. There is also a mini stand in the Switzerland (Canton Bern). This page was last modified at 4 January 2019 at 13:20.